There seems to be a lot of confusion between countries as to what a shallot is and what a spring onion is. Australia seems to have really muddied the waters by referring to spring onions (the long thin allium with the white and green sections) as shallots, which is the opposite to most countries. But on this blog I always refer to spring onions as just described and shallots as the small purple onions which are commonly used in French cooking. 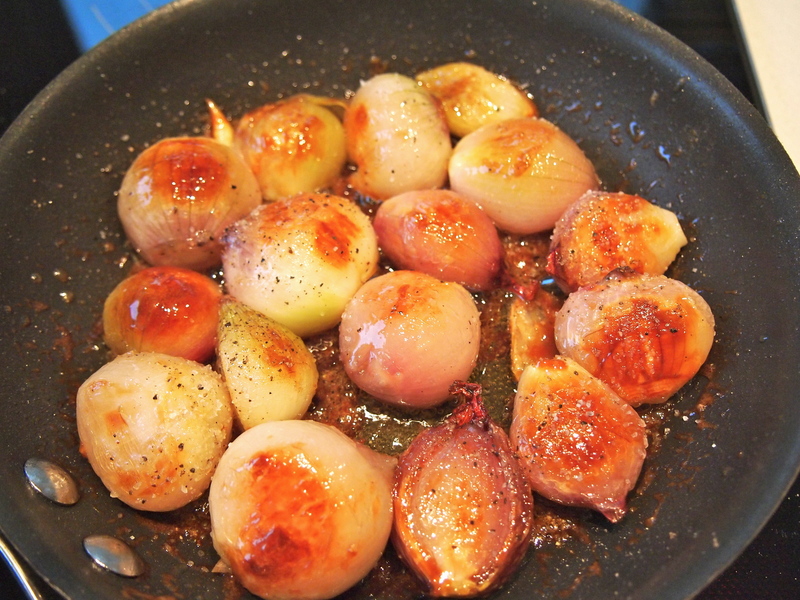 So caramelised shallots, as you can see in the picture, refer to the latter and make a wonderful accompaniment to many meals. I most often use them as an addition to roast dinners. For example, slices of roast loin of lamb sitting on a bed of smashed peas; I like to plate a meal like this individually for dinner parties and to give that little extra oomph, both in presentation and taste, I add a few of these golden gems. But they can certainly be served as a vegetable accompaniment in their own right. 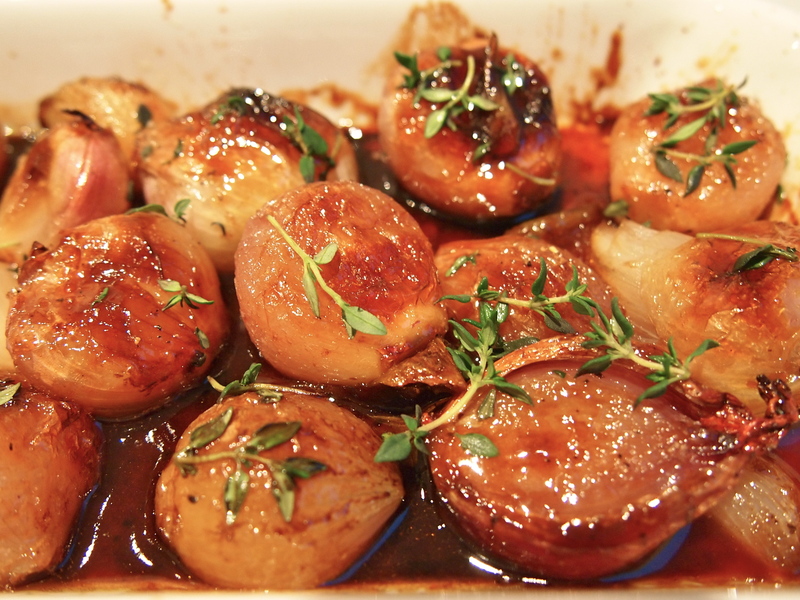 They’re deliciously sweet and tender (think caramelised onions on steroids) with a wonderful tangy caramelised sauce. These don’t last very long so I always make a lot and find they disappear faster than the roast potatoes which is really saying something! Preheat the oven to 200C. The easiest way to peel this amount of shallots I find is to parboil them first, so bring a saucepan of water to the boil and add the unpeeled whole shallots. Boil them for just a few minutes and then drain them. The skins will now be much easier to remove as well as starting the cooking and softening of the shallots. Make sure that when you peel them you keep the root section in tact. Melt the butter in a non stick skillet or frypan, add the shallots and sugar, and toss to coat. Cook over medium heat for 10 minutes, tossing occasionally, until the shallots start to brown. Add the vinegar, salt, and pepper and toss well. Transfer the shallots and sauce to an oven proof baking dish – I like to use something that I can take straight to the table. 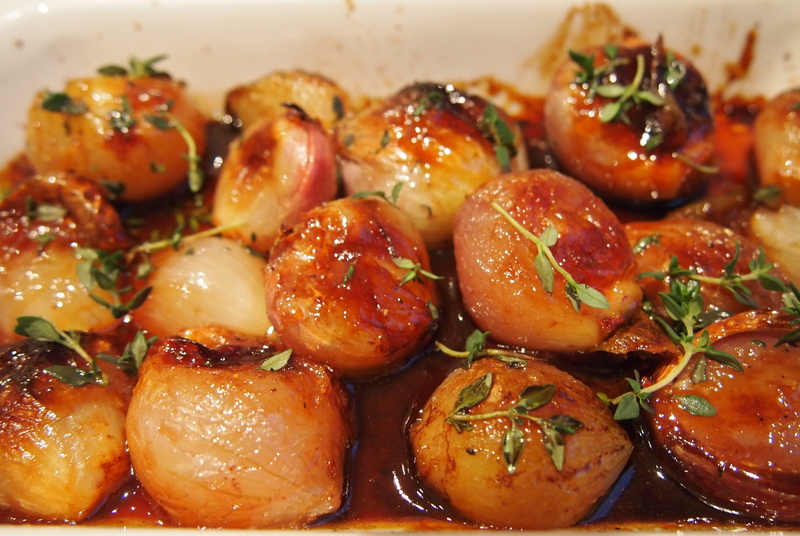 Place the dish in the oven and roast for 15 to 30 minutes, depending on the size of the shallots, until they are tender. Season to taste, sprinkle with the thyme leaves, and serve hot. I am so glad an experienced cook is aware of the confusion. My husband is the cook in our house and if he sends me off shopping with a list which includes shallots, green onions or spring onions, i always have to check exactly what he means! this recepie looks absolutely delicious. I think I’ll add it to his to-cook list !